Katherine is situated 317km’s south of Darwin at the junction of the Stuart and Victoria Hwy’s that form part of the Explorer and Savannah Way tourism drives. 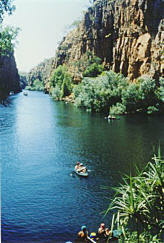 Known as Adventure Territory, the Katherine Region boasts some of the Territory’s most dramatic landscape, including Nitmiluk (Katherine) Gorge. To make the most of your visit to this region drop in to the Katherine Visitor Information Centre when you hit town. Click here for Tourism Topend.